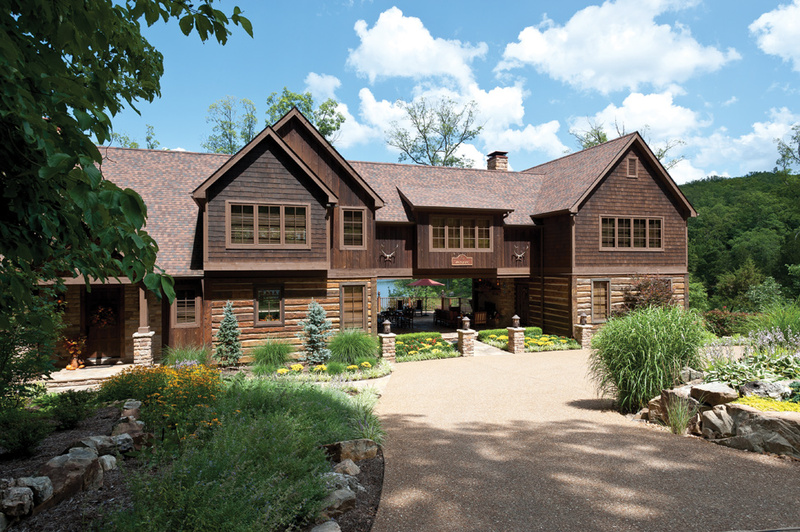 Not your typical old-fashioned farmstead, interior designer Elke Koch and her husband Paul transformed family property into a sophisticated lakeside lodge. 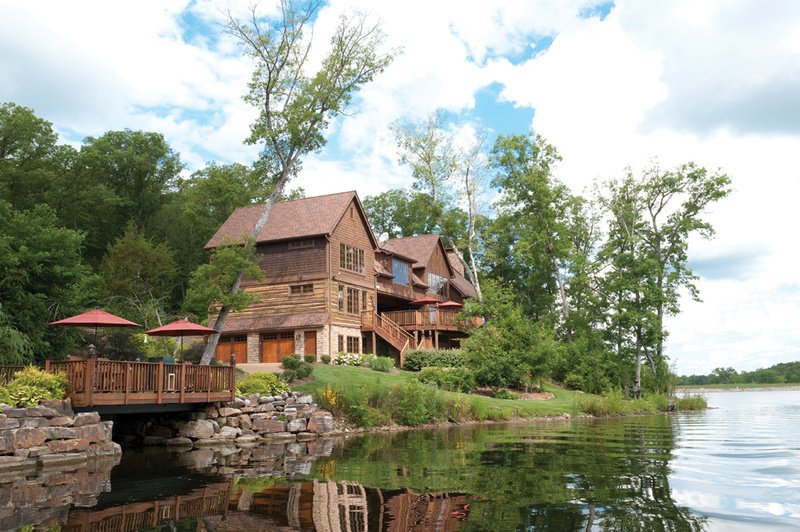 Elke and Paul's home is situated on a 30-acre man-made lake stocked with plenty of fish. 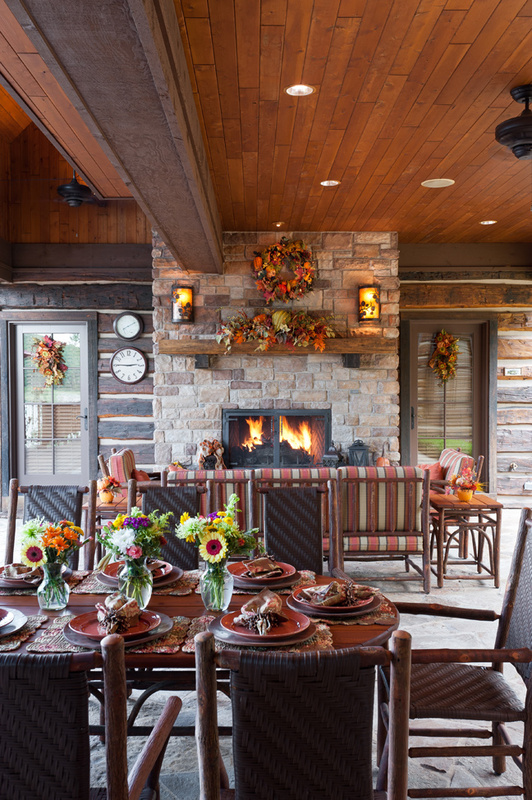 A covered breezeway is the ideal setting for a fall meal or relaxing evening in front of the fireplace. Stone and wood mix to give dimension to the great room. Distressed natural cherry cabinets from Baygents Company warn the kitchen, which is equipped for entertaining and communal cooking. Perfectly set for a fabulous feast, Elke and Paul's dining table seats 10. The fishing room was designed with Paul and Elke's grandsons in mind. 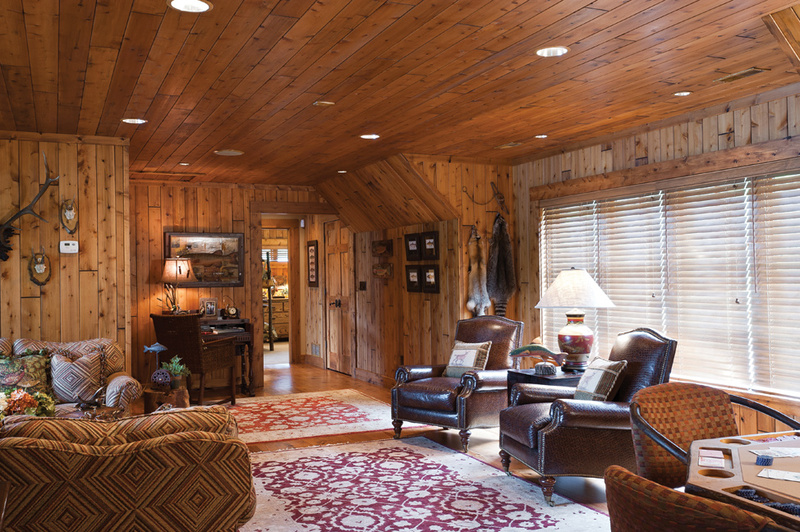 The breezeway that connects the main house and the guest suites features a comfortable sitting room with a game table. Paul and Elke's master suite mixes iron detailing, plush fabrics and stucco walls -- a welcoming change from the wood found in the rest of the house. The guest wing features two master bedrooms with beautiful views of the lake. Nestled deep in the woods, deer and turkey roam this 850-acre farm just outside of Morse Mill. Catfish, bass, bluegill and crappie fill a 30-acre lake upon which sits a refined lodge that is the family compound of Elke and Paul Koch. While the animals and natural elements have been a part of the land since 1969 when Paul’s family purchased the property, the lodge, or the farm, as the Koch’s affectionately call it, has only been in existence for four years. “About seven years ago, our son had a great time visiting the Lake of the Ozarks,” Paul explains. “It got my brother and me thinking about developing our property.” With the idea that the farm would be a place to bring both Paul and his brother Roger’s families together, the Koch’s began building a home on their lake with family in mind. With a number of children, grandchildren as well as friends, Paul and Elke knew their second home had to accommodate the vast amounts of guests they would inevitably host by giving everyone their own space and privacy. To meet this requirement, they came up with an idea where family and friends could still feel connected while having their own private sanctuaries. “The idea for the home came from Paul’s uncle’s house around Columbia,” says Elke. “They would visit when they were young. He had two houses with a breezeway in between. We knew we wanted a similar concept.” Their idea further came to fruition after seeing a similar home on HGTV. Calling in architect Lauren Strutman to bring their vision to life, the three of them designed a main house, which features a kitchen, dining room, great room and master suite, with a main-level breezeway that adjoins the guest house, featuring two master bedrooms and two children’s rooms. “The upstairs bridge also connects the two homes and makes for an easy connection in bad or cold weather,” Lauren explains. Elke established a color palette that includes red and brown wood tones with punches of muted oranges, reds and greens. 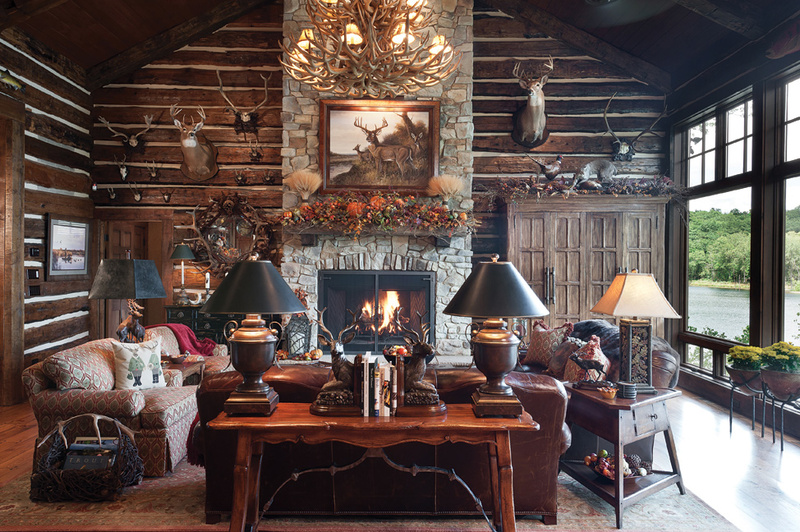 The result is a sophisticated lodge filled with personal touches and prized catches and hunting mounts, including plenty of horns and deer décor, which are a nod to Elke’s Austrian heritage. Entering through the front door, guests and family are greeted in the expansive great room, complete with high ceilings and a wall of windows overlooking the serene lake. A fallen-antler chandelier illuminates the room and brings in a hard element to balance the upholstery and wood. Two plush chairs in a Highland Court fabric and two leather sofas create a cozy seating area in front of the stone fireplace. The great room walls are ornamented in 100-year-old reclaimed wood from Utah, which plays up the lodge feeling of the home. To keep the space more dimensional, Elke mixed fabrics with varying shades of wood and stone. Over time the wear and tear on the soft pine plank flooring, which covers the great room, dining room and kitchen floors, will enhance the character of the space. Open to the great room, the dining area is a true delight for family and visitors sharing a meal. The large table seats up to 10, and complementary upholstered chairs in muted greens, reds and golds provide a comfortable place to sit. With a constant stream of guests and visitors, you will never find Elke and Paul’s table unset. No matter the occasion, Elke outshines herself by setting a beautiful table with seasonal plates and napkins. 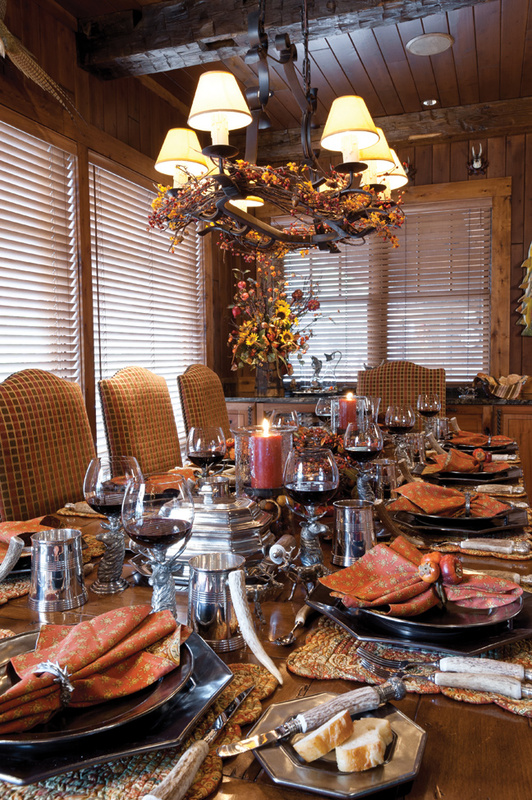 Silverware, cups and serving pieces with horn detailing add to the lodge ambiance. Adjacent to the dining space is the home’s kitchen. Designed to accommodate communal cooking, with a double oven, Wolff cook top, Sub-Zero refrigerator, wine cooler and two dishwashers, the kitchen is well equipped for entertaining large groups. 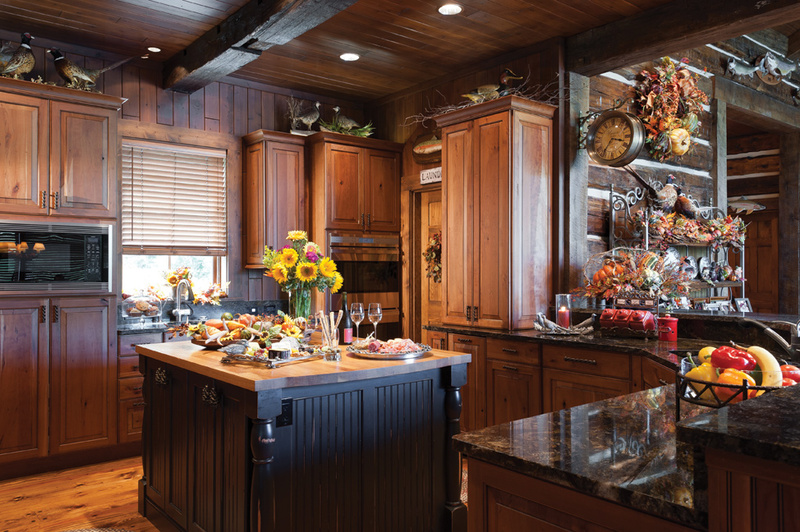 Baygents Company provided the rich distressed natural cherry cabinetry by Wood-Mode. Pulling in the gold and copper tones from the cabinetry, the dark granite countertop is a fitting contrast to the warm wood tones. After a day of entertaining family and friends, Paul and Elke retreat to their relaxed master suite. They fall asleep and wake each morning to the quaint view of their lake. Stucco walls and iron-trimmed furnishings are a welcome change from the abundance of wood in the main living areas. 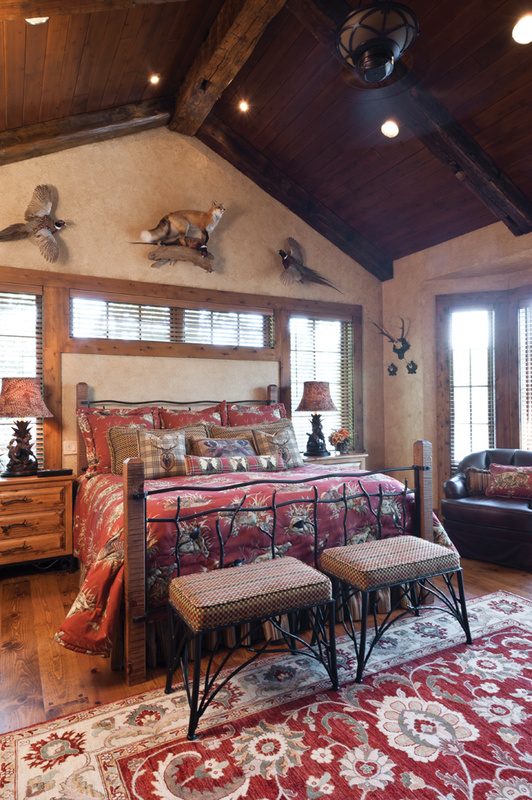 The combination of deer, pheasant and fox décor enliven the suite. One feature Elke and Paul made sure to include in their bedroom was a fireplace. “We have had a fireplace in our bedroom in every home we have had since we have been married,” Elke says. Elke first selected the boutique (themed) fabrics, which are not always easy to find, and then she finished with accessories. Her favorite fabric is in the little girl’s room, where she did a Scalamandre Covey print for her granddaughters. 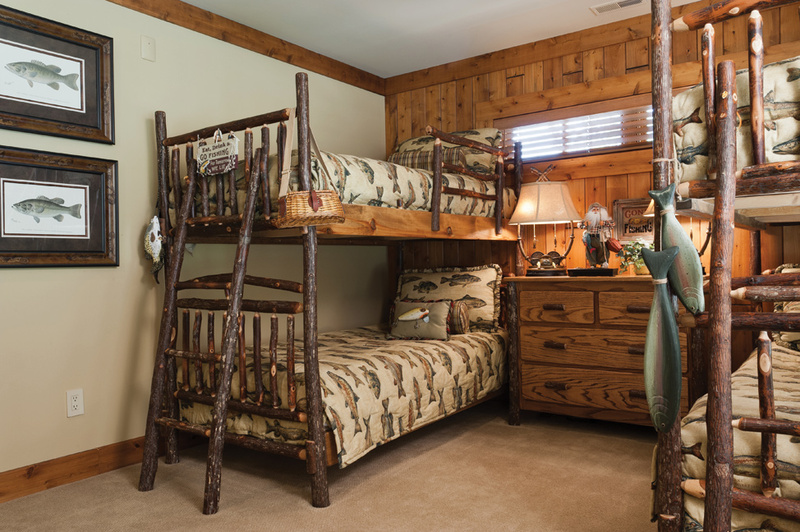 The master bedrooms are furnished with Old Hickory furniture, while the children’s rooms are outfitted with fun finds from Appalachian Rustic Furniture. While everyone has his or her private space, the highlight of the home is the exterior space where Elke, Paul and guests cozy up around the fireplace, dine alfresco, peacefully watch the sunset over the lake or admire Clyde, the fisherman statue who stands at the water’s edge by Mike Casper, that Elke presented to Paul as a birthday gift. Accessible year round, the outdoor space truly is magical. “We love to sit around the fire in the evening listening to the crackling of the fire,” Paul says. As the leaves begin to turn and the chill of the fall air sets in, you can bet that you will find Elke, Paul with family and friends celebrating the season at their farm. 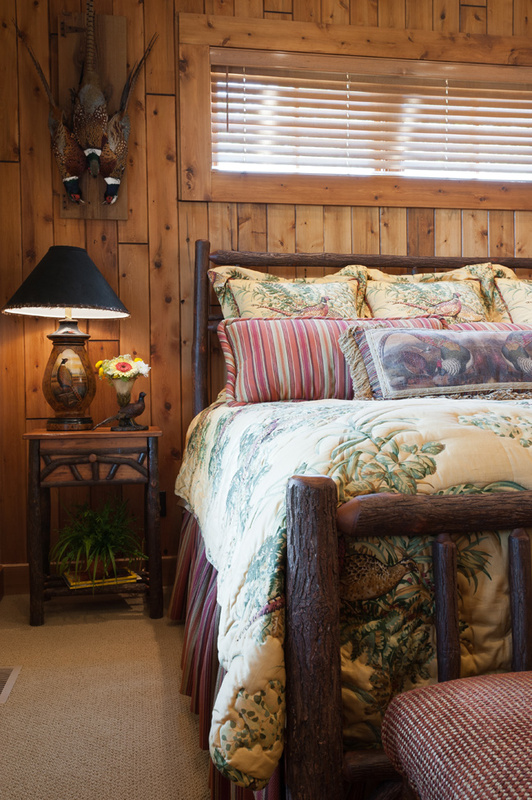 Cozy and warm yet refined, the Koch’s farm truly radiates family, joy and sophisticated style.